It’s not enough that I have turntables, record players, and other equipment to play my 45 RPM records. I needed a way to play them in style! It was during the recent 2015 White Rose Gameroom Show that I was able to make that happen. 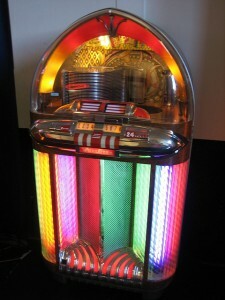 What is a jukebox (some have asked)? A jukebox is an entertainment center of sorts, usually set up in a public place like restaurants, bars, arcades, bowling alleys, etc. to allow music to be played for a small fee. I’m sure over 99% of those reading this article already know what jukeboxes are, but a purpose of the Vintage Volts website is to provide additional insight to past technology for future generations of visitors. So I’ll provide a few details about jukeboxes right now. 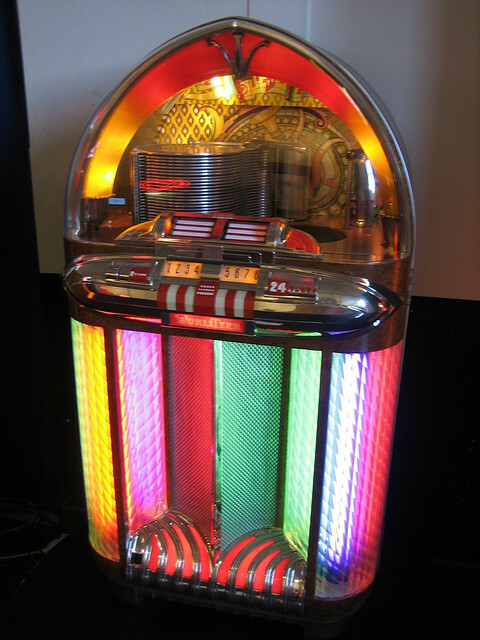 A majority of jukeboxes in history were designed to play 45 RPM records, each having one song per side. Popular music over the span of many decades were presented publicly through their placement in jukeboxes. For only a nickel, dime, or quarter (depending on the decade), you could choose one or more songs to be queued up and played. It was public entertainment. Everyone in the venue you are at will have to listen to your song choices, and are generally exposed to new songs on a regular basis. collectors market. 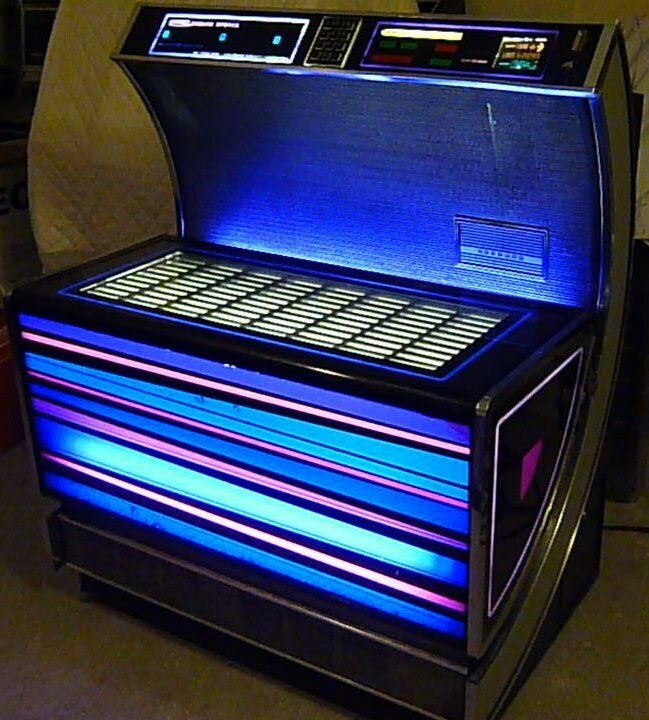 Personally, I like a more modern jukebox with the late 70’s/early 80’s color motif (muted neon and blacklight). I saw a Seeburg USC1 at the show which would look great in my gameroom (as soon as I could make room for it), but she likes the older styles that have a more open view of the play mechanism. When we were at the White Rose Game Show, we found a more affordable alternative to a Wurlitzer which still fit her preferred style category. After negotiating prices and features of several models the vendor had on hand, we purchased an AMI brand D-80 jukebox made in the year 1952. AMI stands for Automatic Musical Instruments and is still making jukeboxes today, although the new jukeboxes play CDs, or even stream music from the Internet. The AMI D-80 is a fourth edition jukebox of the early AMI era (following models A, B, and C). 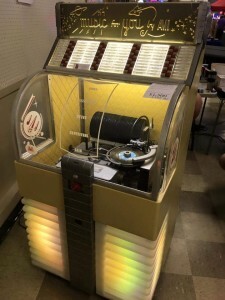 It is one of the first AMI jukeboxes to play 45 RPM records. There is a D-40 which plays 78 RPM records. Earlier jukebox versions were made to play 78 RPM records. The “80” in D-80 means it plays a total of 80 songs, using 40 records, two songs per record. The one thing that makes the older jukeboxes so “cool” is their exposed player mechanism. Where newer jukeboxes tend to hide the operating internals, the AMI D-80 does everything it can to show off its mechanism by design. The D-80 has an operating mechanism which is similar to the jukebox shown on the opening title of the 1970’s TV show, Happy Days. The turntable carriage moves back and forth to line up with the selected record. A pick-up arm grabs the record and rotates it onto the turntable where the tonearm positions itself to play the record. When the record is over, the record is automatically returned to the storage rack. The picture on the right shows the AMI D-80 in all its vintage glory. As you can see, there is a large clear front dome that shows the entire play mechanism. Jukeboxes were still a novelty at the time, and being able to see your favorite record selection play by itself was a visual treat. Below, you can see the mechanism in action as it finishes one selection and returns it to the rack to get ready to play the next selection. The D-80 we bought was refurbished to a suitable operating condition by the vendor, but not to original condition. The painted sides were originally wood veneer that most likely got damaged over time, necessitating the painted look. 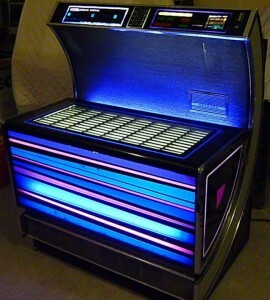 The lower part of the jukebox has rotating color wheels to add a visual effect while on display, but the red color of the tinted wheel had faded away. I am currently working on a modification to return the lower lightshow back to original glory WITH a modern design concept! The record play area is very well lit with a fluorescent bulb. In original condition, the bulb would be in a sleeve similar to those used for the lighting on the lower part of the jukebox. That sleeve would allow for a rotating color filter to cast color into the play area. This one is missing that upper color wheel. I will be designing a modern replacement for the upper light, too. This jukebox does not play records in stereo, however, it will play stereo records, just in monaural. The amplifier is a 5-tube single channel amp which takes the signal induced by the record needle and amplifies it to play out of a large single loudspeaker hidden in the lower part of the jukebox. In my house, I have to keep the volume control on the very low end for a comfortable play level. If I cranked it up even halfway, It would be uncomfortably loud in such a quiet environment. The amplifier is designed to allow connection of multiple speakers. This allows speakers to be hooked up remotely to simultaneously play in other parts of the building. But depending on the speakers chosen, and their respective electrical ratings, they need to be wired a certain way, or damage could occur to the “irreplaceable” parts of the amplifier, like the output transformer. So far, we’re enjoying the jukebox very much. I have over 300 records I can put in it, but only 40 at a time. I’ll have to make up my own rotation list. If there were any additional songs I’d like to install that are not part of my collection, I can take advantage of a regular event I learned about from the vendor I bought the jukebox from. In the county next to the one I live in, there is a monthly record collector’s show. I went there during the first scheduled record show after I got the jukebox (which happened to be the next day after purchasing the jukebox) and I could not believe the selection of 45 RPM records I was exposed to. What’s more, I didn’t know this show was going on in that same county, once per month, since the EARLY 1980’s!!! So much for any advanced knowledge of being a nearby resident almost all my life! 7 Comments to "AMI D-80 Jukebox"
does the belt going from the motor shaft to the 2 stage pully move up and down on the motor shaft on your ami ? causeing some wow. I have replaced both belts,motor pully and the 2 stage pully . its not crazy bad,but notice it thanks perry. It does not on mine. I’d venture to guess that there is a bent shaft somewhere in that mechanism on your D-80. I can’t think of anything else that would cause a belt to shift like that. I have a D40 AMI that I just got up and running, it came from a pinball guy who got it from the original owners son who said his Dad bought it new and had it in his bar in Warren Ohio. A few parts were robbed like the upper light rotating cover , both bottom light covers missing the colored vinyl covers, so all 3 are gone but the lower 2 like light rotating assembly are there at least. The top rotater the is there working but not hooked up to anything. Once I rebuilt the amp , replaced the power cord and Turn Table motor bushings and cleaned and lubed the mech and Turntable the machine worked . i Need the top coin slot in lid and 20 of the 78 to 45 conversation adapter’s and I ordered a new needle. Those adapter’s are a problem 30 dollars each from the crooks on fleabay ! Looking for 20 at a reasonable price. . I also have a G80 1955 that is a lot like this machine inside. The 1951 D40 is different inside though the outside looks the same. That’s a nice D80 you have there ! My D40 and G80 are not belt drive , both have idler wheels. Have a problem with the 1955 G80 mech , a leaf switch was out of adjustment and it caused the mech to jam on a selection finger, near the end of the song it started burning up and I think it smoked the inside relay coil , it doesn’t load the record now unless you manually push the outside then inside relay manually, but it does select and it return the record afterwards. I adjusted the leaf switch properly and it doesn’t jam anymore. I don’t have any D40 part’s or the relays , so I need a G80 Right or inside tt mech relay and 20 of the D40 adapter’s at a reasonable price. Let me know what you think, (and let me know if I can make it public). Hey, I have a 1952 AMI D-80. All of a sudden the select and eject buttons are not responding. Any ideas how to fix?